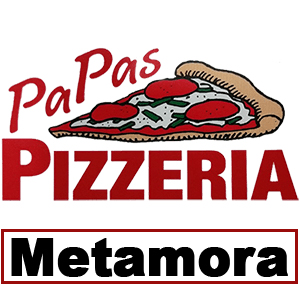 Online ordering menu for Papas Pizzeria (Metamora). Papa's Pizzeria is a traditional brick oven take-out pizzeria, specializing in a variety of unique pizza creations, wings & bread. We use only the choicest meats, finest cheeses, and freshest ingredients. Our hand-tossed dough creates an authentic and delicious meal experience. Papa's Brick Oven Pizzas & Specialty Items stand out from the competition, and that's by design. Located on the east side of Lapeer Road (M-24), just South of Dryden Road.